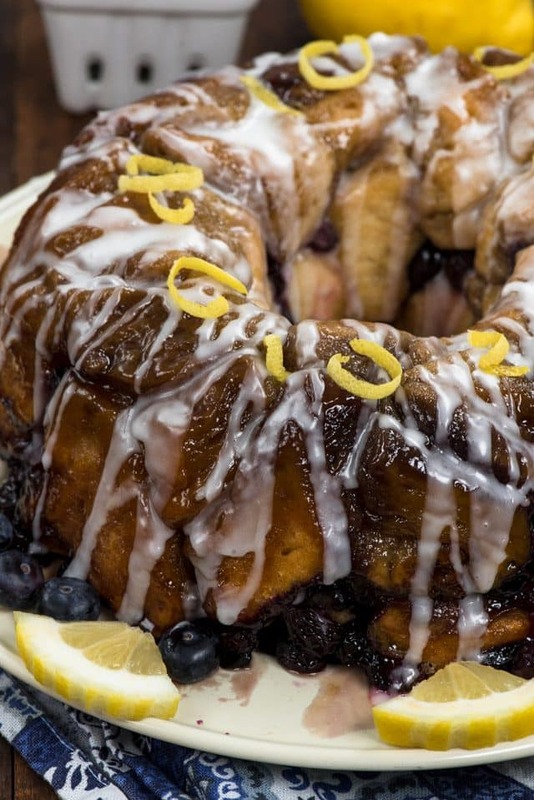 Your favorite brunch recipe: Blueberry Monkey Bread! Turn biscuits into an easy breakfast recipe with fresh blueberries and lemon! Funny story: over the summer my hairdresser messaged me. She needed something sweet for “cheat” day; anything at all, but it had to be nut and egg-free. I don’t know how my mind went to monkey bread but this is the recipe that came out of that request. We make monkey bread every year for Christmas. I’ve made it in a slow-cooker and with frozen dinner rolls, I’ve made it with chocolate, strawberry, and I’ve made monkey bread from scratch. For this version I made it blueberry lemon, which is a super popular flavor combination, especially this time of year. Blueberry is such a classic breakfast ingredient. I love blueberry muffins and pancakes, so why not blueberry monkey bread? The lemon is just something that makes sense as an accompaniment; lemon and blueberry compliment each other. Looking for a new monkey bread flavor? 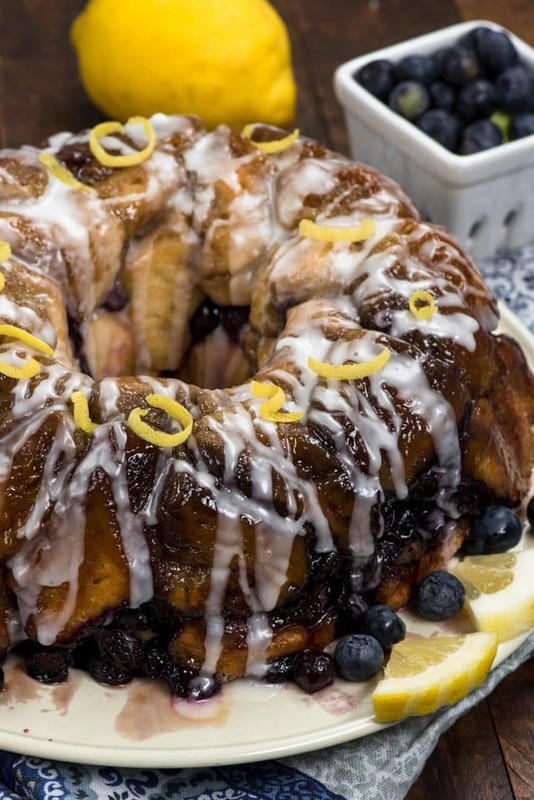 Blueberry Lemon Monkey Bread is the perfect combination of an easy breakfast indulgence! This blueberry pull apart bread starts with Grands! biscuits. Those are the Pillsbury brand of canned biscuits, but you can use your favorite brand. I use the Grands!, which are larger than the normal size, so pay attention to the size of the ones you buy. The Pillsbury Grands! 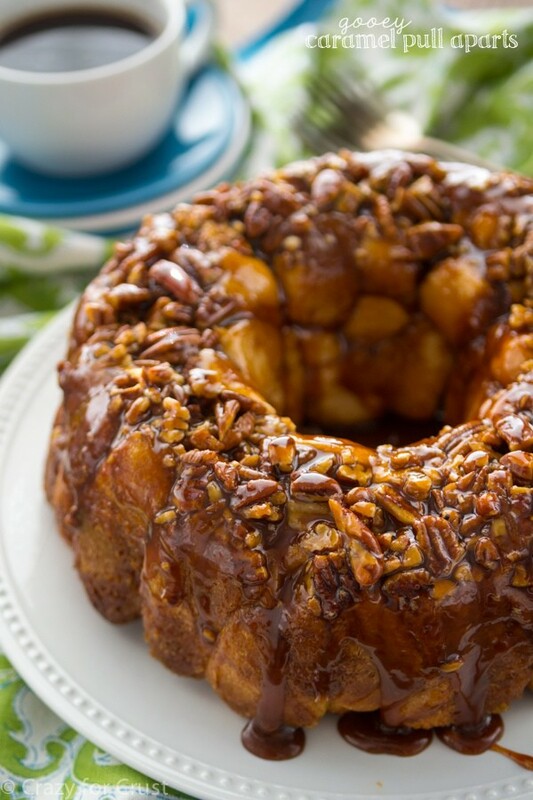 Monkey Bread recipe is a classic, and the one I make every Christmas morning. I basically just edited that recipe to get this easy blueberry lemon version. How do you make easy monkey bread? Simply slice your biscuits in quarters. Shake them in a bag with sugar and lemon zest. Add them to a Bundt pan with blueberries. Top it with a brown sugar and butter mixture. After baking, drizzle with a lemon glaze. The lemon flavor in this monkey bread comes from lemon zest in the sugar that coats the biscuits and lemon juice in the glaze. It adds a wonderful pop of flavor. If you want to make this ahead of time, you can refrigerate the monkey bread before baking. I like to shake up the biscuits with the sugar and then keep it in the refrigerator overnight. In the morning I just make the topping and assemble it, then bake. If you want to make monkey bread with 1 can of biscuits instead of 2, you can! Just use a 9×9-inch baking dish or a 9×5 bread pan instead of a Bundt pan. Find all my brunch recipes here! 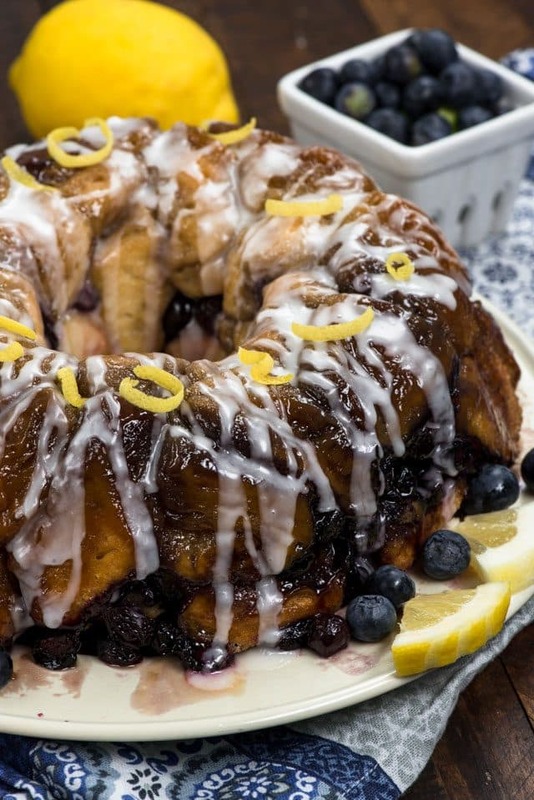 Your favorite brunch recipe: Blueberry Lemon Monkey Bread! Turn biscuits into an easy breakfast recipe with fresh blueberries and lemon! Preheat oven to 350°F. Spray a Bundt pan with nonstick cooking spray. Slice biscuits into 4 pieces each (for 48 total pieces). Place them in a large gallon size ziploc bag. Add granulated sugar and lemon zest. Seal the bag and shake to coat. Place half the biscuit pieces in the prepared pan. Top with half the blueberries, repeat for remaining biscuits and blueberries. Stir together melted butter and brown sugar. Pour over the biscuits in pan. Place bundt pan on a cookie sheet. Bake for 40-50 minutes, or until the biscuits are golden and cooked through. Let sit 10 minutes, then invert onto serving plate. Make the glaze: whisk powdered sugar and lemon juice in a small bowl. Drizzle over monkey bread. Serve warm. Store loosely covered in the refrigerator for up to 3 days. Gooey Caramel Pull Apart use frozen dinner rolls! 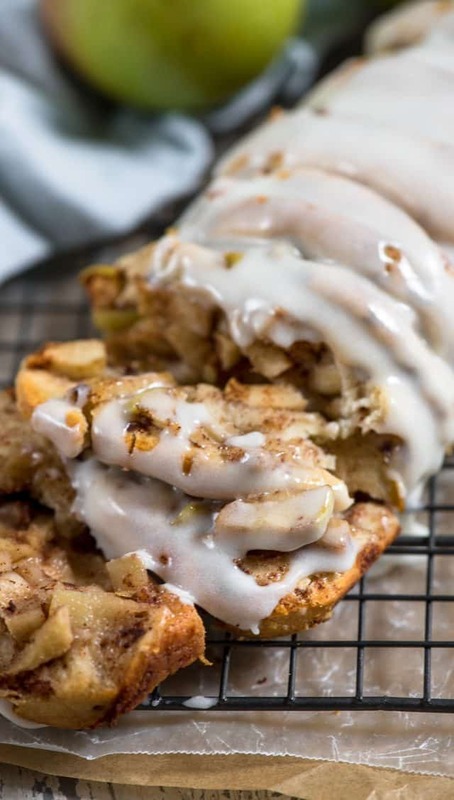 Turn biscuits into Apple Fritter Pull Apart Bread!